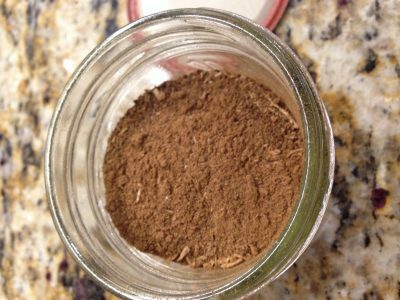 Here’s my story of how I discovered a simple, common weed can be used to make coffee from chicory! 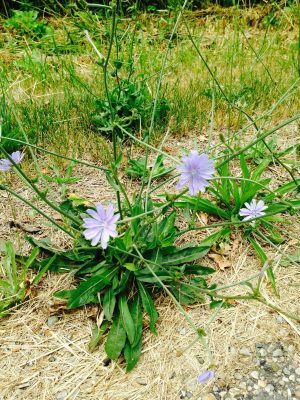 For several years, I’ve noticed a beautiful blue wildflower lining the road during the summer. It starts out looking like a weed, but when it blooms, the flower is the color of a Tanzanite gemstone. I’ve noticed that it also grows well along sidewalks, in gravel, or any other harsh environment you can think of. The plant is a dark green and is about 12-24 inches high. The bluish flower petals are flat at the ends, and slightly “fringed”. The leaves closest to the ground look exactly like dandelion. If you are looking for it on a sunny day, they are easy to see. But, on an overcast day or late afternoon, the flowers close up, and it’s harder to spot. I decided to take some photos and find out what it was. To my surprise, I found out it was chicory. I remembered hearing that it can be used to make a beverage similar to coffee, but wanted to learn more about it. I also wondered if it had any medicinal properties. According to Peterson Field Guide to Medicinal Plants & Herbs, the root can be mixed with water to make a diuretic or laxative. It’s used homeopathically for liver and gallbladder ailments, it can lower blood sugar, and has a slight sedative effect. Chicory root extracts have been shown to be antibacterial, and its tinctures have an anti-inflammatory effect. 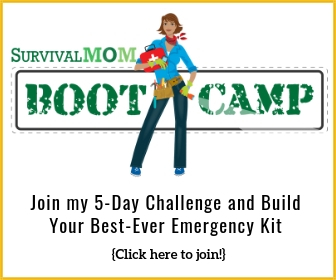 You can learn how to make your own tinctures fairly easily. Next, I wanted to find out what parts of the plant were edible and how to use it to make “coffee”. 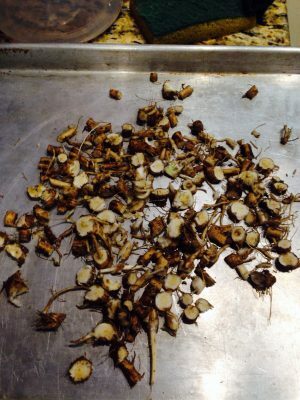 I learned that its root must be dried and roasted before making a hot beverage. Its’ leaves are good for both salad and cooked greens. The white underground leaves are great as a salad green in the spring, and the outer green leaves can be boiled for 5-10 minutes and eaten. I decided to go dig up some roots and try roasting them for coffee. I found plenty of chicory right around my house and along my street. I thought I could just pull them out of the ground but I was wrong. It’s had been dry for the last week and we have a lot of clay soil, so I went and got a shovel. Once I started digging, I found some of the roots are very long. Many broke off as I tried to pry them up with my shovel, but I got a decent sized batch quickly. I soaked them for a short time, then scrubbed the roots clean, and chopped off the rest of the plant. I put those parts in my garden to add to the compost, which is an ongoing project. I patted the roots dry, and sliced them up. I did have to get a heavier chopping knife because some of the roots have a center that is like wood. The really tough stuff, I just added to my garden, and the rest I put on a cookie sheet. I thought I’d try roasting it slow and low. I turned my oven on to 250 degrees and watched it for a half hour or so. It seemed to dry out but not really “roast” the pieces. So, I turned up the heat to 350 degrees, and about 20-30 minutes later, a wonderful smell came from the oven. The root pieces were turning brown and smelled like chocolate, caramel and coffee, all in one. The darker it got, the better it smelled. Once I thought the chicory root was dark enough, I turned down the oven to 300 degrees, so it wouldn’t burn but just roast a little bit more. I would say the total time was about and hour and a half. I took the roasted root pieces out of the oven and let them cool to room temperature. I to ok out my blender, and used the “chop” setting to grind up the roots. I checked on them after several seconds and found it was still too coarse, but once again, the smell was incredible. I think the blades created enough heat to warm the grounds and send the smell wafting up in the air. I knew I needed a finer grind, so I set the blender to “liquify”, and that worked much better. I ended up with a finer grind that almost had the appearance of cigarette tobacco. I was finally ready to brew a cup of chicory coffee! 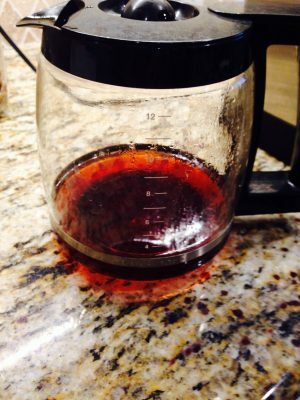 I added 2 teaspoons into my coffee filter and add enough water to the pot for one cup of coffee. I watched it brew, and it looks dark , just like regular coffee. By the way, in a power outage, a French Press is highly recommended for every coffee lover. 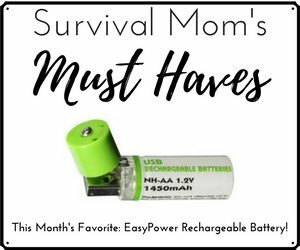 You can get one for less than $30, and it’s worth every penny. Now, the taste test. First, I tried it black. It tastes just like a strong black coffee (too much chicory?) but with a definite mocha, possibly caramel flavor. I may have used too much chicory, so next time I’ll use 1 to 1 1/2 teaspoons per cup when I brew. S ince I don’t normally drink black coffee, I added a tiny bit of stevia (here’s Survival Mom’s preferred brand) and some Coffee Mate to this aromatic concoction. Oh, my, GOSH!!!!! This is like a fabulous cup of coffee from a pricey coffee house. I really thought it wouldn’t be this good. I can’t wait to go out and gather more chicory root! If SHTF, this will be priceless. There is no caffeine in this drink, so you can have a warm beverage, late at night. 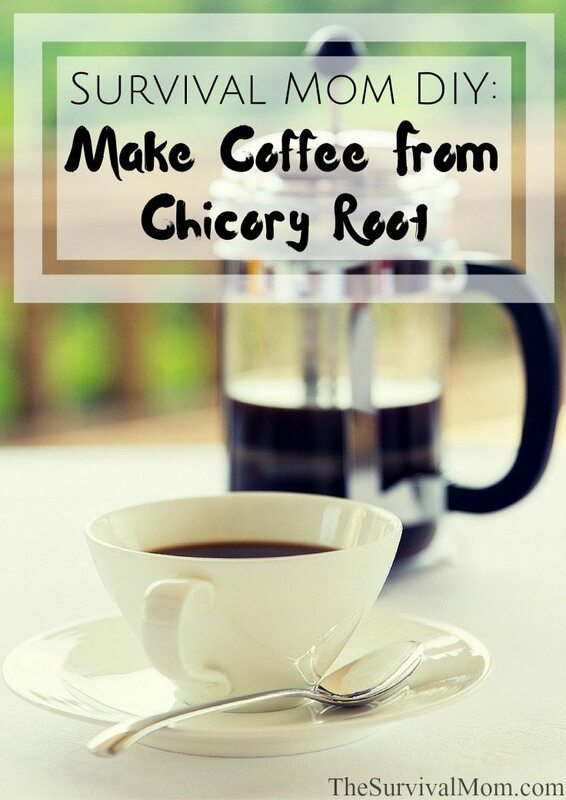 I had no idea how easy it would be to make coffee from chicory. I highly recommend foraging for this wonderful and amazing plant. 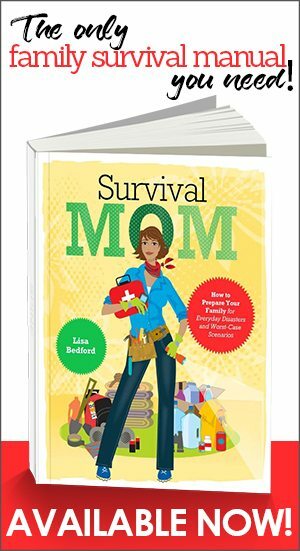 I can’t believe we’ve lost so much knowledge over the years about living off the land. We all should learn foraging skills. This coffee alternative is free, abundant, delicious, and a great barter item. Better yet, just try it now to enjoy, but save some for yourself for later! 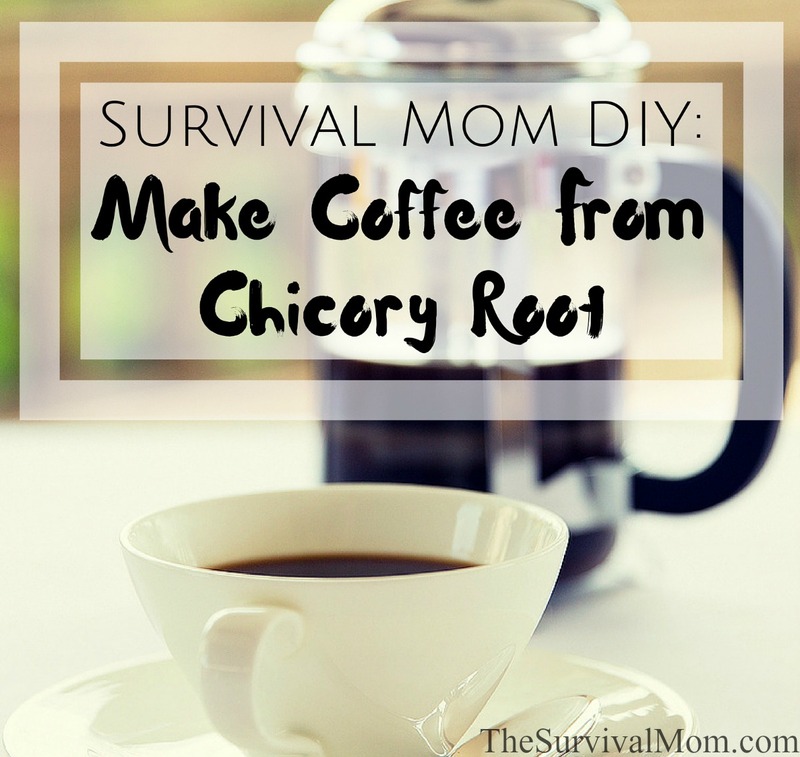 Hi Survival Mom, as a kid growing up in the 60’s i remember some of the coffee bought in the stores had chicory in it, Adding some home made chicory would be a great way to stretch the coffee stores you have. Thanks for the info. You’re welcome Steve! In the southern USA, they often add some Chicory to regular coffee, and call it “Louisiana Coffee.” It imparts a nice nutty carmel Mocha flavor to it. Now it’s a part of my normal preps. my grandparents were IN the depression and the ‘days of shortage and rationing of WWII”…in those days of less they made ‘coffee’ by using a hand ground mix of scorched/toasted wheat berries and the roasted chicory… (chicory by itself is a thing to strip the tongue) they were very glad when they could get ‘real’ coffee again. Thanks for the fantastic article. I think I am going to figure out how to store this and keep in my emergency stash. Can you grow the plant in your garden? I think Chicory would grow in a garden, but I’ve only seen it growing in the harshest conditions. It grows well along the highway or edges of parking lots. it seems like the worse the environment, the better it does. Thanks for the article! I planted some chicory in my yard last year, and this year I have LOTS of plants. I love the flowers. You are right, Mary, that the harsher the environment, the better it grows. My best chicory plants are actually growing in hard, rocky soil. I can hardly wait to try making the coffee, now that I know how! I forgot to say that you can buy the seeds from a company called Strictly Medicinal Seeds. I just tossed mine out into the yard, and finally they took! 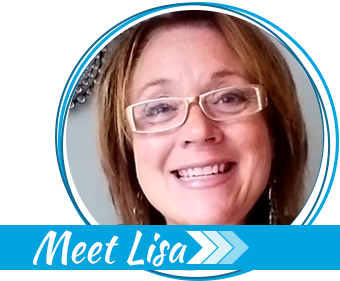 Hello Lisa, I just got back from a short drive from one job to the other here in the flats of central Illinois. I read this article two nights ago. On my way back to the office, I’m stopping every few hundred feet in these mile squared of country roads and gathering this plant. Very cool!! I’m interested to know whether or not you like the taste of chicory coffee. I love the taste of Chicory Coffee! It’s a strong Brew, similar to Starbucks, so I’m adding less Chicory now. It has a nutty, carmel & mocha flavor to it. I made a second batch a little darker (I left it in the oven too long), and it’s very strong, so I prefer my lighter roast. Wow, wow, WOW! Not much acclamation is needed from this coffee drinker. I ended up not oven roasting but rather pan toasting. FREAKING AMAZING! Everything on this site and others that I’ve read is exactly what happened, smelled and tasted. So after a few sips of this straight root stuff, I added my usual honey and 2% milk and drank almost the entire cup. A fat 2/3’s to be exact is what I consumed and the longer I sipped it the more I could taste the “mocha” flavor… 5*s!!! My plan; gather enough Chicory to be able to cut with my whole bean coffee to a 2:1 ratio. Wow. That is quite a testimonial to the power of chicory! So glad you gave it a try and liked it! Community Coffee in Louisiana makes an arabica & chicory blend that is to die for! I was introduced to it in 2005 when I was doing relief work post-Katrina and to this day it’s the only coffee I drink. I’ve elevated it from simple coffee to a food group! Lol! They also sell their chicory as a stand-alone product, in case anyone wants to know what to aim for when using from-the-wild chicory. Bottomline, in a post-apocalyptic world, chicory will be a significant item to have.